New Life in Spain: Zara Zara Zara! While finding a Zara-store is now just as easy as finding bread and cheese, I thought I'd share a little story from my second day in Barcelona. There was no Zara-store where I lived in Norway, but I always went to a Zara shop when traveling abroad, and just after I arrived Spain and Málaga I told my roommates that I had loved visiting the store there (but been a good girl and not bought anything). This was when I had already decided on moving to Barcelona (hence the not buying & not wanting more stuff for my already overweight suitcase), and my roommate told me that there was a huge Zara-store just off Plaza Catalunya in Barcelona (the very heart/center of the city), it had several floors, he told me, and casually, as if it wasn't a big deal "You should have a look." He had been there on a trip to Barcelona with female friends, and gotten really bored while they spent wwaaaaay too much time there (according to him, of course). Have a look? I decided I would go over it with a fine-tooth comb as fast as I could. So, on my second day in Barcelona I made my way to Plaza Catalunya and was ready to explore this huge wonder of a Zara-shop. Plaza Catalunya is a big square and there are buildings and shopping streets on all sides, so I wasn't sure where to start. I guess I looked a little lost where I was standing there looking to all sides trying to decide where to start looking first, when a tourist-bus-person came over and asked me if I needed any help. The people from the Barcelona tourist bus usually stand all over the square giving out maps and trying to sell tickets for the bus, and they also work for the tourist office. I was suddenly feeling a little self-conscious about the fact that I was not looking for a Gaudí or the Picasso-museum or anything culturally important, just a shop…But hey, if he wanted to help, I was grateful! “Ehm, yes I have heard there is a Zara-shop close to here, a huge one. I want to go there!” Big smile for effect. “Really? But where are they?” me increasingly anxious to get moving. “Well, there’s one that direction [pointing], and another one that direction [pointing], and another one that direction [pointing]…"
After having spent some time in the city I know that it’s true that there are many, and they are basically everywhere. But in case you, just like me, are going to Barcelona and visiting a great Zara-shop is one of the things you want to do, I have made a little map with all the Zara-shops in town. 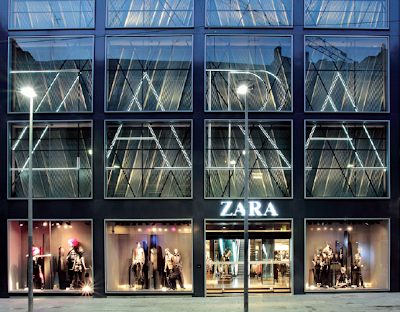 The one at Rambla Cataluya 67 and the one at Passeig de Gracia 16 also has Zara home. I like buying in Zara, but only when I stay in Spain, the others countries Zaras are too expensive, compare to Spanish Zara. I think you have a very good point. I heard about prices in Norway being almost doubled for the same pieces. That is a robbery! I don't know if we even have Zara in the states? I definitely noticed them in Rome and went in a few. They are very cool stores! I love your story...I have done things like that! Thank you Sarah. I am not sure how far Zara has gone by now, but it's originally Spanish and here you find stores "everywhere". They have great stuff! Who doesn't enjoy a little retail therapy? Wowza. That is glamorous entyrway. It's a very nice place to shop! Beautiful clothes at relatively nice prices. Oh, I love Zara. My favorite store. :) I always find something there, I think I have never left the store without buying anything, it is pretty bad but I like all their stuff. This one made me smile, before we got Zara in Finland I used to love visiting the stores when abroad. :) And Happy New Year by the way!! Just like me! And thanks the same!! I LOVE ZARA!!!!! The first one I went to in Barcelona (I don't recall which one), I wasn't very impressed. But the second one...goodness! I spent a few euros there, and still daily carry my beautiful handbag from Zara! ZARA! Now you're speaking my language! Hahaha, I thought I might be! If you like Zara , you should check their building in Salamanca. The building itself is beautiful. Of course what they are offering inside is great as well. I think I need to go to Salamanca! Not just for Zara though ;) My needs are satisfied with miss Zara, but I have wanted to see Salamanca for so long! Haha glad to help ;) Have a great trip!! we went to the store in passeig de gracia and brought home lots of good and affordable loots! thanks for this, super! Great that you found good stuff!